Michael Vick is once again a dog owner. 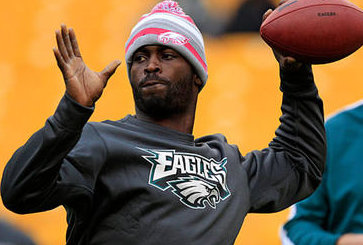 Last night, Michael Vick released an official statement, confirming nearly a week of media speculation: He has a dog. I strongly support Vick’s desire to break the cycle. I believe that the rest of his life should be devoted to that work. But I also feel this effort can and should be made without bringing an animal into his home. Aside from “he’s served his time,” the most prevalent defense given for Vick’s dog ownership is his children. Why should they pay for their father’s transgressions? Don’t they deserve the experience of growing up with a family pet? Vick’s children deserve love, attention, food, clothing, shelter. But saying they deserve a dog is a little like saying they deserve a private-school education or the opportunity to travel the world or a giant jungle gym in the backyard. These are privileges. Some kids have them, some don’t. In the real world, outside of professional football, want does not equal get. There are all sorts of reasons a child may grow up without a pet in the home. Because your dad had a long history of torturing animals would seem to be among the most logical. Several years ago, Vick actually commented directly on raising a family without a dog. “That’s the hardest thing,” he said. “Telling [my daughters] that we can’t have one because of my actions.” But that’s just it — the very thing you need to be telling them! Some actions have consequences that cannot be undone. If Michael Vick wants to instill in his children a lifelong respect and compassion for animals, he should encourage them to volunteer at their local shelter. He should talk to them about his own actions, how ashamed of them he is, and read to them about heroes like Michael Mountain and Naoto Matsumura. The Michael-Vick-as-victim approach just doesn’t work for me. Let this man live? Who lives better than Vick? If you prove you have an incredibly violent, sadistic aspect to your personality that manifested over many years and in various forms, you have forfeited your right to have animals. If anything, our animal cruelty laws in this country are too lenient and unenforced. Crimes of his magnitude should carry the heaviest punishment with the least chance for leniency, not cries for second chances. This is bigger than one football player, one sick man’s heinous actions. This is about our society’s attitude towards animal cruelty and about sending the message that we do not tolerate it. A few short speaking engagements to cheering crowds does not show growth or commitment to animal welfare. You want a dog, Mr. Vick? Prove with your actions that you’ve earned it, not statements issued via the best PR firm money can buy.